We asked 25 global insurance companies if they still support coal. You can’t drive a car or get a mortgage without insurance. Likewise, fossil fuel companies can’t operate their coal mines or build new power plants without insurance coverage. They depend on insurers to cover the legal, financial and natural risks of their projects. Burning coal is the most important cause of climate change. Researchers have concluded that we cannot afford to build any new coal power plants and have to retire existing plants early in order to meet the goals of the Paris Agreement and avoid the worst impacts of runaway climate change. Insurance companies are supposed to protect us from the impacts of catastrophic risks. Some of them have warned about the risks of climate change since the 1970s, and many officially support the Paris Agreement. Yet in spite of their rhetoric, insurers continue to enable climate-destroying coal projects. They offer insurance coverage without which these projects could not go forward, and have invested more than 500 billion dollars in fossil fuel companies. 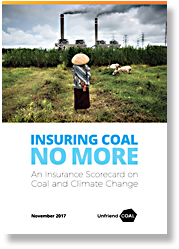 The Unfriend Coal network is a global coalition of NGO’s and social movements that is pressuring insurance companies to get out of the coal business and support the transition to clean energy. Work in insurance? Contact us to talk to one of our issue analysts. Fill out the form and we’ll get in touch. What did you want to talk to one of our analysts about? We'll treat your information sensitively.